It’s tempting for boaters not to wear a life jacket while on the water, especially on beautiful summer days. They want to get some sun, think they’ll get too hot, think they are a strong swimmer, or simply think that nothing can happen to them. Regardless of a boater’s recreational water activity, there’s never an excuse for them and their passengers not to wear a life jacket. Accidents can happen at any time. The North American Safe Boating Campaign is a yearlong effort in the U.S. and Canada focused on spreading the message of boating safety and the critical importance of always wearing a life jacket each and every time on the water. In addition, the campaign also reminds boaters of the importance of boating safely, such as taking a boating safety course, never boating under the influence, and knowing navigational rules. The annual campaign kicks off the weekend before Memorial Day with National Safe Boating Week and continues throughout the year with family-friendly boating safety events. May 19, 2017: Wear Your Life Jacket to Work Day is a fun, educational way to heighten awareness of different life jacket styles, including inflatable life jackets, and demonstrate their comfort and versatility by boaters wearing them to work. Participants are asked to take a picture of themselves in their life jacket while at work and post it to the Ready, Set, Wear It! Facebook page (facebook.com/readysetwearit) or submit directly to the NSBC at outreach@safeboatingcouncil.org. Participants are also encouraged to tweet their picture using #RSWI2017. May 20, 2017: As a kickoff to National Safe Boating Week, the seventh annual Ready, Set, Wear It! Life Jacket World Record Day is hosted by the National Safe Boating Council and Canadian Safe Boating Council. Boating safety educators, marine enforcement officials, politicians, media, and the public will gather around the world to try to beat the world record of 10,917 life jackets worn and inflatable life jackets inflated on one day, and share about boating safety. Find or register a local event. May 20-26, 2017: National Safe Boating Week is recognized by boating safety advocates across the U.S. and Canada to promote safe and responsible boating, including consistent life jacket wear every time boaters are on the water. From family friendly events at marinas to vessel safety checks, this week is packed with life-saving messages about responsible boating. The North American Safe Boating Campaign fun doesn’t stop after National Safe Boating Week! Boating safety organizations and state partners are dedicated to sharing fun boating safety awareness throughout the year from life jacket fashion shows at community events to boating safety experts sharing at schools, and from free vessel safety checks to boating safety education and training. For organizations looking for boating safety event ideas, please see the Grassroots Outreach Program from previous years. 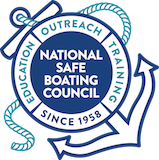 As part of the campaign, the National Safe Boating Council offers free resources to state agencies, organizations, and individuals to help promote safe boating in their communities. Browse free resources. For information about the life-saving importance of wearing a life jacket while boating, please browse BoatBeat Fact Sheets.